Yay for the weekend! I hope you all have some fun plans for this weekend - it's the beginning of summer so hopefully you'll be able to enjoy some sunshine outdoors. I still have to continue baby proofing the house, making sure she can't get into drawers and moving chemicals to upper shelves. She's really starting to roll around and pull herself to get around, and I think she'll probably be crawling any day now. Uh oh! 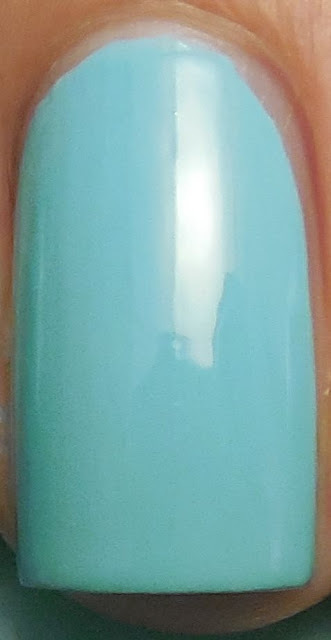 Tonight I have a long time lemming to show you, and that's Orly Gumdrop, a powder blue cream. I finally snagged it after finding out that CVS was marking all the old style bottle of Orlys half off. It was about time! It went on streaky the first coat, but was perfectly opaque at two coats. No pooling to report although the formula was on the runny side of smooth. This is without any topcoat so you can see it's shine. 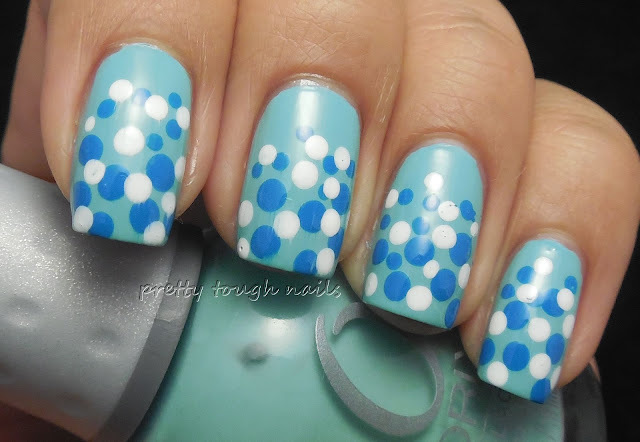 This blue served like a blank canvas and I was compelled to try a dotticure with Sinful Colors Snow Me White and Why Not. I think I may have over-dotted the dotticure! I'm still trying to get the hang of using the dotting tools and making even sized dots, but overall I guess it didn't turn out too bad! I made sure that the dots dried fully before applying Essence Gel-look topcoat so that there wasn't any streaking. I think overall it's a fun summer manicure. Have you tried any dotticures lately? Such a pretty color! Love it with the dotticure.